Tourneo Custom is the perfect choice for every trip you wish to take, with a 5-star Euro NCAP safety rating, spacious and versatile seating configurations for every travel, be it with people, cargo or both. Roll Movement Intervention, also known as Roll Over Mitigation helps Tourneo Custom stay upright during emergency evasive maneuvers and sharp turns. Sensors in the ESC system detect instability during these situations and reduce torque to the wheels along with applying emergency brakes - thereby helping to stabilize the vehicule. Tourneo Custom's Flexible rear Seats allow you to configure your space to fit all your needs. Each rear seat is not only foldable, but also removable to make space for your cargo. 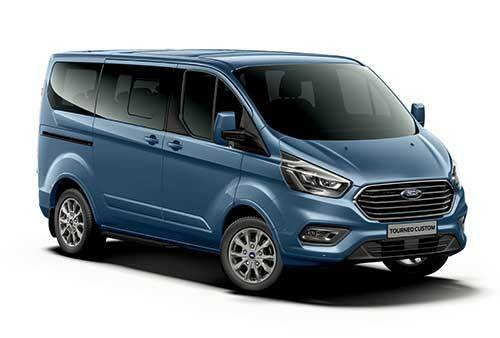 With the possibility of upto 30 seating arrangements, three ISOFIX mounting points for children's seats, and spacious interior - Tourneo Custom suits every travel you wish to undertake. The Tourneo Custom provides safe stowage for cups, bottles and mobile phones in easy to reach spaces. In addition underneath the dual front passenger seat, you also have access to a hidden stowage area. The Electronic Stability Control (ESC) senses variation from your driving line and automatically helps correct your position on the road by reducing available torque and making brake adjustments to each wheel. Hill Hold Assist temporarily stops you from rolling downward when making a hill start. The system works by maintaining pressure to the barke system for an extra 2 seconds, giving you more time and control as you move your foot from the brake pedal to the accelerator. It's also handy when you're stopping and starting on slippery surfaces.